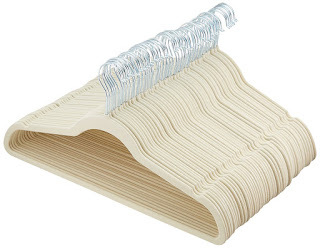 Right now over at Amazon, Prime Members can score this 50-Pack of AmazonBasics Velvet Shirt/Dress Hangers in ivory/beige for just $12.98. These velvet-lined hangers prevent clothes from slipping, plus they are ultra-slim so you can maximize the space in your closet. OR anyone can score this 100-Pack of AmazonBasics Velvet Shirt/Dress Hangers in black for just $19.98 (Retail $33.99)!